I’d encountered Christine Lingerie various places around the internet, on television and on a few blogs. I’m actually guilty of not exploring them further because I made the assumption that plus size customers often make about companies that work with luxury goods in high quality silks: I assumed they wouldn’t make my size. While I’m reviewing a gorgeous robe today, I want to start out with the remarkable fact that Christine Lingerie makes a wide range of pieces in larger sizes. If you’re looking for a great silk teddy or chemise, you definitely owe it to yourself to look through their webstore. 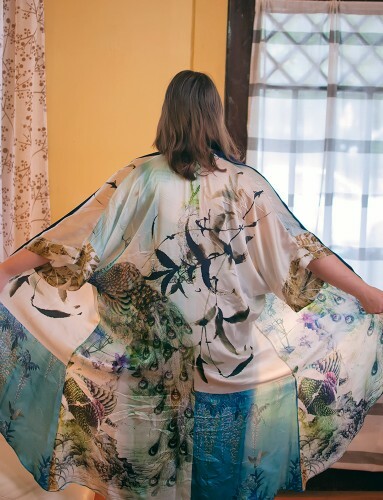 This Gatsby Kimono incorporates two of my favorite lingerie traits: it works with everything and it’s a work of art. You could hang it on your wall and people would be equally impressed. Christine Lingerie works with digital prints to produce especially rich effects and it really shows. The robe creates different views of the print as it moves, which adds an extra dimension of beauty. And while this isn’t my usual outerwear look, it works perfectly with my usual clothing philosophy: one great eye catching piece can create a whole outfit with amazingly little fuss. I’m wearing it here with wide legged black pants to help channel that Gatsby era spirit, but it would work with leggings or over a navy blue minidress equally well. It transitions to lingerie-mode easily, which means you can just throw it on anytime you need to look elegant in a pinch. It spices up even the most basic lingerie set in a lovely way, as you can see with this basic ecru Kris Line babydoll set. No matter how it falls, you get a gorgeous view of a new part of the pattern. That blue patch down near the bottom is one of my favorite bits. This piece is one of the rare lingerie pieces that works well on all ages and a wide range of figures. I have a fear of baggy clothing and this manages to highlight curves rather than make me look larger. Part of that effect is due to the incredibly wonderful silk which falls perfectly – there’s a reason it’s almost impossible to get that same effect with rayon or polyester. I foresee myself wearing this all over the place this summer and taking it on lots of trips – it seems like a great piece to travel with to spice up lots of different outfits. And finally, since this definitely is in the luxury price point, I want to finish with a discount code! SUMMER1 will give you 15% off on this Gatsby Robe or any other item in the Christine Lingerie webstore from July 15th through July 31st. What do you think of this Gatsby Robe? Have you tried Christine Lingerie?